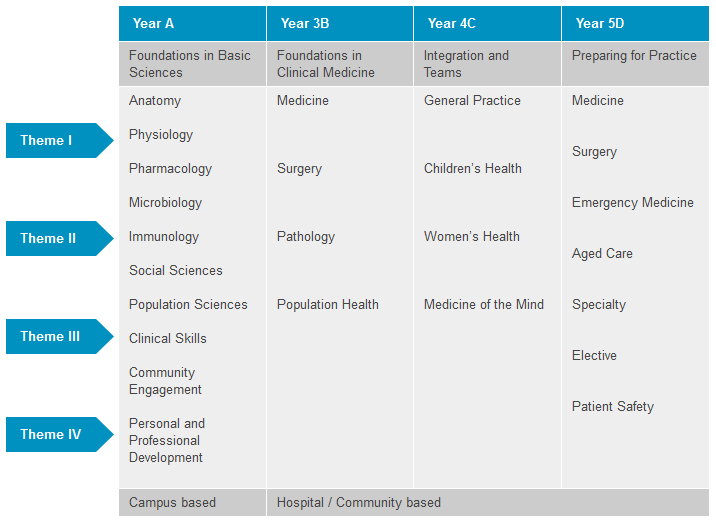 The four-year Monash University graduate entry Medical course is designed as an integrated, interdisciplinary curriculum. The basic knowledge, skills and attitudes that are embedded within the curriculum will be related to clinical and other problems or issues. Learning in appropriate medical and other health professional contexts is an overarching principle. The course will prepare you to graduate with the knowledge, skills and attributes of a beginning medical practitioner. The overall vision is to deliver a course that supports the high international reputation and strengths established by the Faculty of Medicine, Nursing and Health Sciences at Monash University. The four years of the course are referred to as Years A, 3B, 4C, 5D. Year A is delivered at the School of Rural Health - Churchill. Years 3B, 4C and 5D are available across both metropolitan and rural locations. focuses on the personal and professional attributes and qualities needed by students in the medical curriculum and as future medical practitioners. This theme covers elements of professionalism, communication skills, ethics and legal issues, clinical effectiveness, and health and behavioural self-management. the knowledge and concepts of the basic medical sciences and clinical sciences as they underpin medicine. The basic medical sciences of anatomy, biochemistry, genetics, microbiology, histology, pathology, immunology, pharmacology, physiology and psychology are taught in an integrated manner and from a relevant clinical perspective. In Years B, C and D, learning occurs in a more overt clinical context, building on existing knowledge and encompassing pathology, diagnostic and therapeutic skills, with a particular focus on common and important conditions and presentations. encompasses the whole range of clinical skills from the earliest to the latter parts of the course. Practice in clinical skills is emphasised early and often, and includes procedural and clinical skills. The approach in clinical skills teaching and learning will be to develop defined clinical competencies. This will begin with clinical aspects of communication skills and move through history taking and physical examination to the more advanced clinical and procedural skills. In Year A the basic professional, biomedical, social and behavioural concepts are introduced. There is a particular emphasis on clinical issues as illustrated through the cases presented in the problem-based learning sessions. Clinical and communication skills are developed and students undertake early clinical placements in hospitals. Students will also commence the Community-based Practice program and participate in learning activities in Indigenous health. In Year 3B students are placed within Monash teaching hospitals. The emphasis moves towards multi-system disease representations that will form the core of the learning in integrated medicine and surgery. The fourth year of the course, Year 5D, is structured as a number of clinical placements (or rotations). These rotations take place in both community and hospital settings. One of the rotations is an elective placement, where students will choose to complete their degree by gaining wider experience in chosen disciplines and specific areas of interest.